I’m sure you will love visiting Jaipur again. When did you last visit the Pink City, Aditi? Certainly an interesting walk, Arv. Not at all, Arv. that was one place I did get to – I have some almost identical photos to some of yours! I’m glad you did get to visit City Palace. There aren’t any views as such, quite likely that we all will end up clicking similar pictures, Mick! That’s true. Most of my pictures are of the 4 gateways – one was being repainted at the time. They’re rather photogenic, I must say. You have highlighted an important aspect – people wait for the gaze! This definitely added a different element altogether. It is true that women didn’t have independence in the current context but they were empowered with many other things. I’m sure there were many interesting stories that we have missed because the narratives were never recorded and were passed down generations verbally. I’m keen to know about women’s status in your native country, Mabel. Were Chinese women independent or it was a similar case? As far as I know, for a long time Chinese culture leans towards patriarchy. Most of the time if women had nothing to say, it would be acceptable. Times have changed, and definitely for the better. Once again, such an interesting tour. I think most Asian cultures are similar. Yes, times have changed, Mabel. Absolutely and that makes it easier to connect. Right, Mabel? Very informative and great photos as always! What is the need to travel and go in person after reading this exhaustive post, with lovely pictures! Thank you for this walk arv, I couldn’t have known so much history without it! How you remember so much of info is a marvel! 🙂 Do you jot down the points when you visit such places? Well, it is true that blogs allow us “virtual travel”. Isn’t it so? I probably will never be able to visit so many places that I read in blogs. At least not in this lifetime! To answer your question, I never makes notes. I get engrossed in the conversations. And then the sights are too tempting to miss, so photography keeps me engrossed. Do you make notes in such instances? This was a virtual walking tour of the City Palace with many important inputs, very well composed with beautiful pictures. Mel, I’m happy to read that you have visited Jaipur twice and are considering another one! 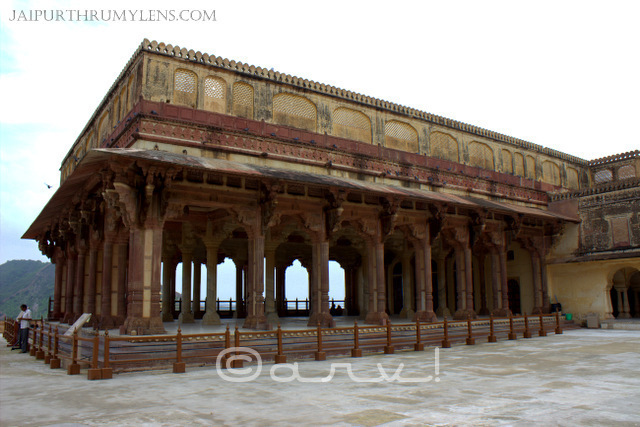 Indeed, Jaipur is quite popular among travelers because it is not just about heritage and tourist places. Jaipur offers so much more. It is a unique mix of culture, heritage, religion, and tradition. Where are you based, Mel? Hi Arv. On top of all that, in Australia the last couple of weeks they have been playing The Indian Dream Hotel on ABC TV. This focuses on a group of English retirees who live in Jaipur for three weeks to see if they could retire in India. A really interesting show and so much lovely footage of Jaipur. but it seems to be popular. I’m glad you enjoyed this show. Thank you Arv, for this post, it brought back so many wonderful memories I have with beautiful Jaipur. Cornelia, It seems you had a great time in Jaipur; it is evident from your comment. Did you visit City palace? Loving it how you’re really digging deep into featuring Jaipur with each of your posts. Incorporating the people who help spread the love for culture and heritage and of course featuring different aspects of places makes for wonderful reading. Thanks! Thanks, Raghav. Jaipur being one of the popular tourist cities, I’m sure a lot of travelers have already ticked City Palace from their list. An offbeat stuff like this is a nice addition since it’s unlikely that someone will visit City Palace again. I’m sure the museum curators of City Palace are doing a great job! Haha! It’s not easy to do so but….. it is okay once in a while! Did you find this interesting, Neel? Yes Arvind. It definitely was, enjoyed those nuggets of information, a window to the life of those rajas and maharajas and their ranis. Brilliant once again! I am living in the old city my whole life, but I wasn’t aware of these facts. Really nice. Keep Posting. Happy to know you are from Jaipur, Shikhar. And I thought most residents will know Jaipur history! Nice and detailed description. Although general guides also gave many of the information, the info about ladies quarter was new. Not that I did not politics and power struggle, but the information that underground tunnel was used to reach the ladies quarter was new. Did they show such passages? Your posts are good to read. I agree that much of information is generic but sometimes you find interesting ones too. Most residential sections of forts and palaces had secret tunnels meant for emergency exits in case of wars. I’m not sure about other cities but they designed the palaces in such a way that king could access any of the queen’s quarter discreetly. To rule out jealousy, I suppose! Wonderful detailed list this one. The city palace is a good place to learn about the history of the city. I wouldn’t say that one gets to know much about history, it is rather a peek into the past with collections of garments, furniture, personal weapons etc. Only way to know more about the history of Jaipur is by hiring a guide which many of us don’t do. I wish the museums in India provided some bits of history as it enriches the visitor experience. As always Arvind 🙂 fantastic post with perfect captures ! Monika, you are right. Even though royal women were never out in public but they were behind the games of politics and schemes. There was always something cooking! Is Jaipur discussed in the book you mentioned? Thanks, for stopping by and adding your perspective, Monika! Hope you are doing well. You have been away for quite some time! The book is on the Mughal women. There must be one on Rajput women too I suppose. I visited Jaipur five years ago, when I was still in school. Brought back so many memories.